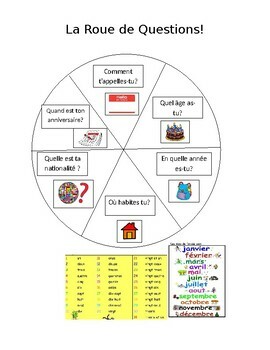 Use these two speaking wheels to promote oral speaking in French using questions for a Je Me Présente unit. Students can practice describing themselves in French! Students LOVE this fun and engaging activity. In partners, students will place a paper clip on the tip of a pencil and place that on the center of the wheel. While holding the pencil in place, they will flick the paper clip so that it spins around the wheel until it stop and lands on a question. Students can then ask each other the questions and practice answering in French. Continue until all questions are asked, then switch to the second wheel of questions.